The central government is planning to give the cash reward of Rs. 1 Crore to secret informers who provide information about benami property to investigation agencies. This initiative is likely to be announced by month of October end or first week of November. What is Benamdar in Benami Properties? The person in whose name the property is purchased is called Benamdar. Finding Benamdars is very difficult task for income tax officials as well as the administrators. 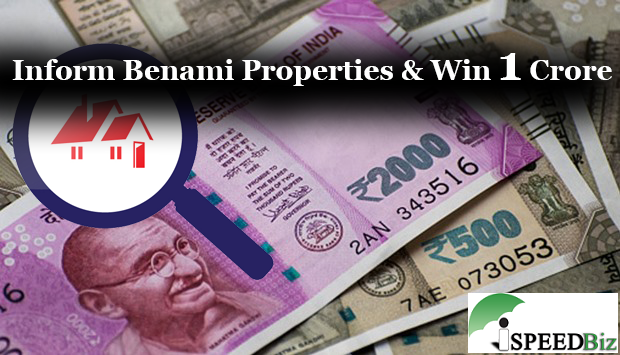 What are the Benami Properties? The benami transactions include buying assets of any kind — movable, immovable, tangible, intangible, any right or interest, or legal documents. A property bought by an individual, not under his or her name is benami property. Property held in the name of spouse or child for which the amount is paid out of known sources of income. A joint property with brother, sister or other relatives for which the amount is paid out of known sources of income also falls under benami property. The transaction involved in the same is called benami transaction. The benami properties attached include deposits in bank accounts and immovable properties. How to Win Cash Reward? According to the official, the informer needs to inform details about benami properties to investigation agencies of CBDT. The department will never disclose the identity as this could endanger the informer.,” he said. To curb black money, the government decided to amend original act and the Benami Transactions (Prohibition) Amendment Act, 2016 came into effect from1st November 2016. Several benami transactions have been identified since the coming into effect of the amended law. The Benami Property Law introduced last year lacked this provision of secrecy of informer.